The ozone layer surrounding the Earth plays a role as “a space suit for the Earth“ to protect the ecosystem, including the human population, by absorbing most of the harmful ultraviolet rays from the Sun. However, man-made gases such as Freon gas have been destroying the ozone layer. 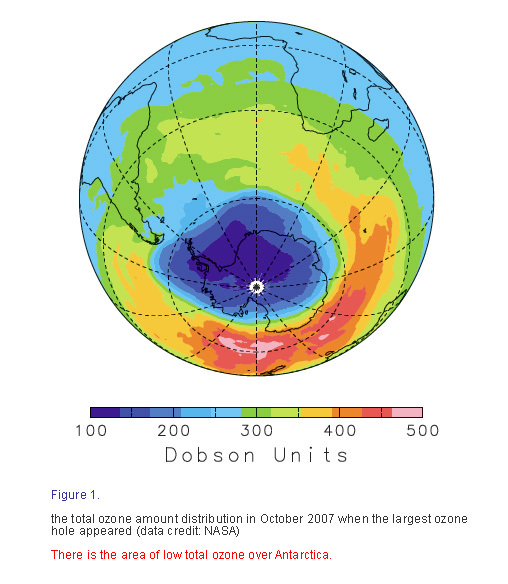 There is an ozone hole above Antarctica (Figure 1), and the decline of ozone levels has been observed in Arctic and mid-latitude areas. This is due to the causative gases such as Freon, which have been used as refrigerants for refrigerators and air conditioners. The gases are dissolved in the stratosphere after being emitted into the air, and turned into ozone-destructive substances. To study ozone layer depletion, we have to measure not only atmospheric ozone, but also the slight amount of chemical substances in the air (atmospheric minor constituents). Among many kinds of atmospheric minor constituents, there are substances such as carbon monoxide generated from Freon, which is the key in the chemical reactions that could destroy a large amount of ozone. One of the main purposes of this study is to measure the concentration of atmospheric ozone and atmospheric minor constituents on a regular basis, and to monitor changes in these concentrations. How can the concentration of ozone and atmospheric minor constituents in the air be measured? For the measurement, submillimeter waves will be used, just as for cellular phones and kitchen microwaves. Submillimeter waves refer to the radio waves with the shortest wavelength from 0.1 to 1 mm. Each of many atmospheric molecules, including ozone molecules, is known to emit a unique submillimeter wave at a specific wavelength, so the concentration of the molecules can be measured through such submillimeter waves. The point of this study is that ozone and atmospheric minor constituents in the air can be observed from the International Space Station (ISS) in space without anything disrupting submillimeter waves (Figure 2). The Superconducting Submillimeter-Wave Limb Emission Sounder (SMILES) aims at establishing observation technology for the submillimeter waves emitted from atmospheric minor constituents, and at detecting the global increase (or decrease) of ozone and atmospheric minor constituents in the air with high sensitivity and accuracy. The submillimeter-wave observation technology from space is still under development in many countries. The advantage of the SMILES is that it has a receiver with superconducting technology so that it can conduct observations with a greater sensitivity that has never been achieved before (Figure 3). 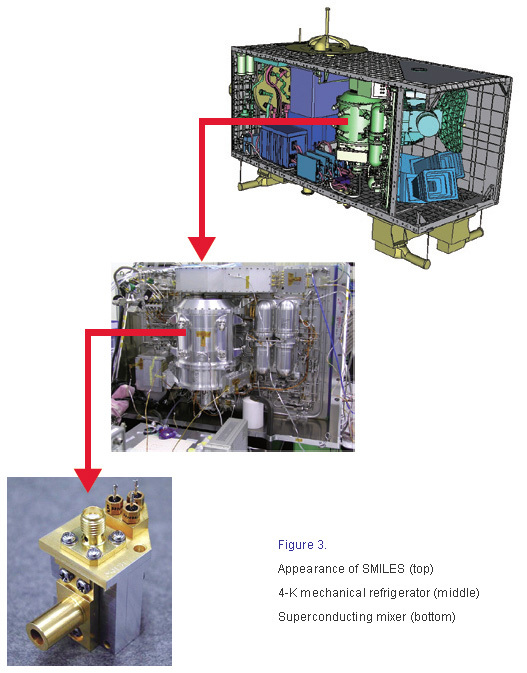 The receiver is composed of a superconducting sensor (a receiver) cooled down to 4K by an ultracold refrigerator (mechanical refrigerator), and low-noise amplifiers cooled down to 20K and 100K. Japan has special expertise in ultracold refrigerating technology, which has been used for conventional infrared astronomical satellites, and the technology has been further developed to be used for the SMILES. The submillimeter wave observation targets natural radio waves emitted from atmospheric minor constituents. That means, it does not require any light sources such as lighting systems or the sunlight that is usually needed to view with the naked eye. Therefore, submillimeter wave observation can be performed for 24 consecutive hours, any time day or night. After the SMILES starts observations, vertical concentration distribution data of atmospheric minor constituents can be obtained from more than 104 sites worldwide everyday. 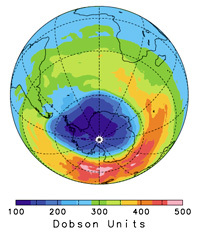 Analyzing such observation data from the SMILES to understand the mechanism of depletion and recovery of ozone will help predict changes in the ozone layer with precision, and develop ozone layer protection measures.